Download Speculations IV as a PDF. The Architecture Exchange, a new platform aimed at fostering serious debate between architecture and newly emerging ideas in other fields, founded by Joseph Bedford (doctoral candidate at Princeton University) and Jessica Reynolds (director at vPPR Architects). The Architecture Exchange will begin as a public lecture-based and on-line institution with the aspiration to become a gallery/event space in London in the future. The format for each series is that a carefully selected group of architectural thinkers are invited to discuss the ideas of a contemporary thinker in relationship to architecture, with a final talk by the thinker him/herself responding to the architectural papers previously presented. These presentations are filmed and uploaded on to the website, and the papers are compiled into a new publication series. We are excited to announce that the first series focuses on the philosophical work of Graham Harman, the leading figure in the Speculative Realist movement, as we believe that his object-oriented philosophy offers a new and vital framework that might stimulate thought in architectural discourse around the topic of the real and the sensual. Responding to the series’ question, “Is there an Object-Oriented Architecture?” Graham Harman’s radical reading of Heidegger is discussed in relationship to architecture during three events in May by six eminent architectural thinkers: Peg Rawes (UCL), Patrick Lynch (Lynch Architects), Jonathan Hale (Nottingham University), Adam Sharr (Newcastle University), Lorens Holm (Dundee University), and Peter Carl (London Met). The fourth and final event of the series invites Graham Harman to respond to the speakers, concluding with a round-table debate with all the participants. All talks are free and hosted at the Swedenborg Society (20-21 Bloomsbury Way, London WC1A 2TH) on the dates listed below. Berlin-based META Magazine presents METAphorisms by Tim Morton and Tammy Lu. Aphorisms by Morton, drawings by Lu. META asked artist Tammy Lu and philosopher Tim Morton to meditate on classical metaphysical vocabulary, by means of philosophical musings, color, form and motion. (…) Here, she takes on Morton’s philosophy by providing visual, topical and poetic maps, objects of all shapes and sizes, growing and enmeshing, and so it dawns on us that we are objects ourselves, entangled with other objects, no matter if these are bees or coffee machines. The 2011 vol. 3 issue of Analecta Hermenutica is now open access with downloadable PDFs. It contains a number of contributions on speculative realism, object-oriented ontology and actor-network theory, including a piece by Jay Foster, “Ontologies without Metaphysics: Latour, Harman and the Philosophy of Things,” which discusses at length the February 2008 debate between Harman and Latour at the LSE (published as The Prince and the Wolf). 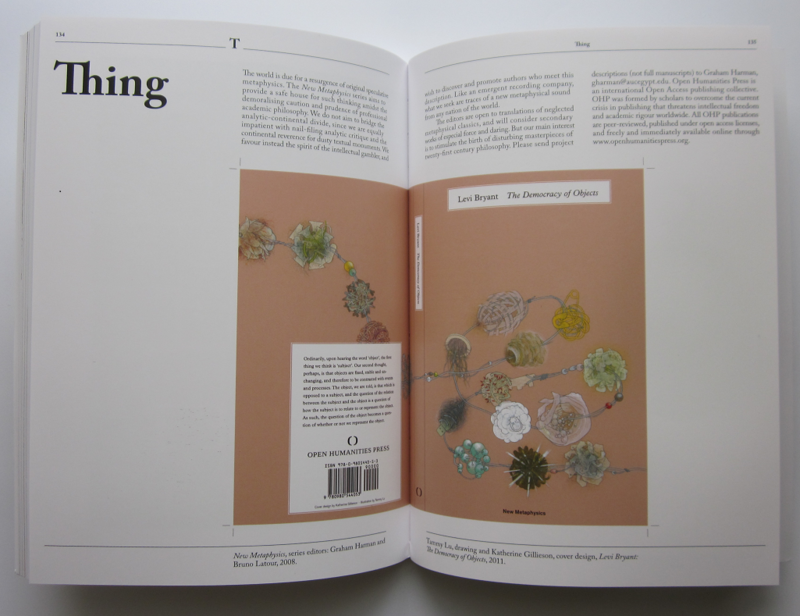 Under the letter “T” in David Evans’s Critical Dictionary, “Thing” is represented by Tammy Lu and Katherine Gillieson’s cover design for Levi Bryant’s The Democracy of Objects book, accompanied by Graham Harman and Bruno Latour’s prospectus for the New Metaphysics series at Open Humanities Press. Hat tip to Tammy Lu. Abandoning the conventional format of the dictionary, Critical Dictionary is an ambitious cornucopia of ideas, images, and illustrations, that emphasise the open-ended, provisional and unfinished nature of language, communication and meaning. Inspired by the mock dictionary Georges Bataille edited for ‘Documents’ in 1929 and 1930, Critical Dictionary is an adventurous title, aiming to puncture pretension, and declassify terms in a playful, humourous manner. Bringing together newly commissioned work, material gathered from online art magazine criticaldictionary.com, and featuring elements such as a retrospective assessment of the ZG magazine by former editor Rosetta Brooks, one of the seminal products of the art scene in the 1980s, and catalyst to the development of the so-called ”Pictures Generation”, Critical Dictionary is a rich exploration of ideas and language in all its forms. The Critical Dictionary exhibition had just opened at the WORK Gallery in London and will be on until 25 February 2012. Third Annual International Summer School in German Philosophy: “The Ontological Turn in Contemporary Philosophy” (July 2-13, 2012) at the Rheinische Friedrich-Wilhelms-Universität Bonn. What is the world? What do we mean when we speak of the world in philosophy and claim things such as true thought being about the world? Is the world “out there,” as Bernard Williams and Adrian Moore’s “absolute conception of reality” suggest or is it a horizon or regulative ideal guiding our epistemic practices? In metaphysics, ontology, and epistemology it is common to speak of the world without bothering to explicate what this term means. Even though it features in debates concerning our access to the external world and even in book titles like Mind and World, it usually does not seem to express more than the vague realist assumption or platitude that not all objects or facts are made up, hallucinated, or in some way or another constructed by thinking subjects. Much of the 20th century’s linguistic turn, both in the analytical and in the hermeneutical/phenomenological traditions, assumes that the world is what we have access to with truth-apt thought, yet also is that which might be distorted by our attempts to grasp it as it is in itself. Over the last decade, many voices (such as Hilary Putnam, Stanley Cavell, Alain Badiou, Quentin Meillassoux and Paul Boghossian, to name a few) have urged that the overall territory of the debate regarding the position of thinking in a world of facts is fundamentally confused by missing the very facticity of the world. This has triggered a thoroughgoing return to realism, prominently figuring in the thought of the avant-garde movement of “speculative realism” or “speculative materialism,” as it has been labeled. Interestingly, the debates often associated with Badiou’s ontology and the critique of all transcendental philosophy in Meillassoux’s After Finitude have, in a recent turn, led to a reassessment of German idealism, for example in the work of Markus Gabriel, Iain Hamilton Grant, and Slavoj Zizek. On a closer look, it turns out the Fichte, Schelling, and Hegel’s criticisms of Kant can be read as attempts to overcome transcendental epistemology and themselves motivate an ontological turn. This year, we will discuss an array of perspectives on the ontological turn developed by the organizer and visiting professors in recent work. In particular, we will address the concepts of speculative philosophy, the relation between transcendental philosophy and ontology in general, the issue of contemporary forms of realism and materialism, and the prospects for a suitably realist or materialist reading of figures such as Schelling, Hegel, and Derrida. The philosophers assembled will present and discuss their recent work in the form of a lecture followed by a seminar. Everyone admitted to the Summer School will receive a reader with texts to be prepared before arrival. More details here. H/t Graham Harman. 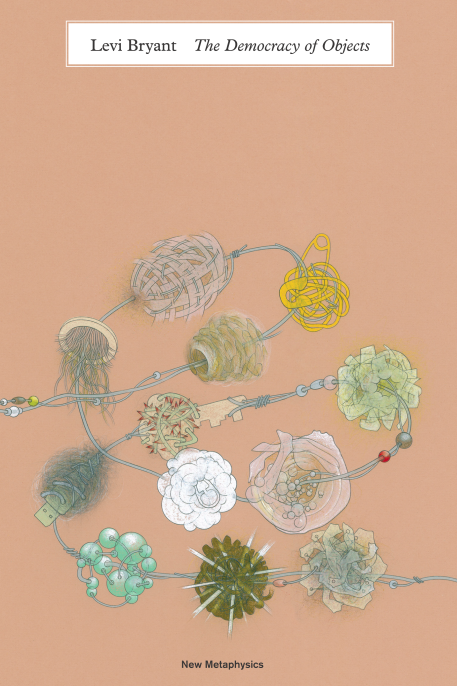 The cover of Democracy of Objects features a series of fantastical objects of similar scale and spacing strung on a piece of something like barbed wire. The book The Speculative Turn that you edited with Graham Harman and Nick Srnicek features a pair of pruning shears. Barbed wire was a revolutionary technology that fundamentally shifted settlement patterns across the North American midwest; pruners are the ideal general purpose tool for maintenance and propagation of vegetation. Can you talk a little bit about the choice of those images? To be quite honest I had no role in choosing the images for either of my books, though I couldn’t be more pleased with the choices of the editors. I’m particularly fond of Tammy Lu’s cover for The Democracy of Objects as I believe it very much captures the spirit of my thought. Seen from afar it looks like flowers intertwined along threads of ivy. This very much captures my conception of objects as something that “bloom” or unfold, just as the Greeks conceived phusis as a blooming or unfolding. However, as you look more closely you suddenly see a hint of menace (the barb wire and fishing tackle), as well as a universe that somehow manages to beautifully interweave natural entities, computer memory storage devices, barb wire, fishing tackle and so on. Tammy Lu’s work captures the sense of a flat ontology where nature, culture, and technology are not distinct ontological realms but rather where all entities are intermingled on a single flat plain of immanence and where there is no supplementary space that contains them but only the relations they forge with one another generating a network space. It is a world of great beauty as well as lurking menace. The cover of The Speculative Turn is a bit more masculine and difficult for me to decipher. No doubt pruning sheers were dimly chosen to convey the sense of something of the tradition—the Kantian correlationist legacy—being pruned away. This would be the aggressive, warlike dimension that seems especially popular among those speculative realists that fall in the nihilistic eliminativist camp and that seem to revel in death and destruction. Indeed, perhaps a major fault-line in speculative realism is between that camp that emphasizes construction and building (though without a anthropocentric reference for these terms) found among the object-oriented ontologists and the process-relationists, and that side that seems delighted by tearing down, destroying, and death found among the nihilistic eliminativists. A more generous reading of the pruning sheers, however, would be to comprehend them along the lines of the bonsai tree, as the collaborative process that takes place between humans and nonhumans in the cultivation of collectives. I heard it through the grapevine that there will be a seminar series discussing The Prince and the Wolf at at the National College of Art & Design in Dublin. More details at the Art in the Contemporary World blog and A Little Tag End of the World blog, where apparently some of the discussion will be posted. The latest addition to object-oriented ontology: Levi Bryant of Larval Subjects fame publishes the HTML version of his new book, The Democracy of Objects. PDF and paper version to follow. This is the first book in the New Metaphysics series edited by Graham Harman and Bruno Latour at Open Humanities Press. Cover design by Katherine Gillieson, illustration by Tammy Lu. Since Kant, philosophy has been obsessed with epistemological questions pertaining to the relationship between mind and world and human access to objects. In The Democracy of Objects, Bryant proposes that we break with this tradition and once again initiate the project of ontology as first philosophy. Drawing on the object-oriented ontology of Graham Harman, as well as the thought Roy Bhaskar, Gilles Deleuze, Niklas Luhman, Aristotle, Jacques Lacan, Bruno Latour and the developmental systems theorists, Bryant develops a realist ontology that he calls “onticology”. This ontology argues that being is composed entirely of objects, properties, and relations such that subjects themselves are a variant of objects. Drawing on the work of the systems theorists and cyberneticians, Bryant argues that objects are dynamic systems that relate to the world under conditions of operational closure. In this way, he is able to integrate the most vital discoveries of the anti-realists within a realist ontology that does justice to both the material and cultural. Onticology proposes a flat ontology where objects of all sorts and at different scales equally exist without being reducible to other objects and where there are no transcendent entities such as eternal essences outside of dynamic interactions among objects. Adam Robbert of the Knowledge Ecology blog makes good use of The Prince and the Wolf in reflecting on the relationship between metaphysics and politics within the wider context of debates in speculative philosophy. An interesting post all around. You are currently browsing the archives for the speculative realism category.